I wasn't expecting too much from Submarine Attack when I received it for Christmas 1991, but as I play-tested my many new Master Systems games such as Running Battle, Cyber Shinobi, Alien Storm, Rambo 3, Assault City and Galaxy Force it soon became apparent that Submarine Attack was surprisingly good title. 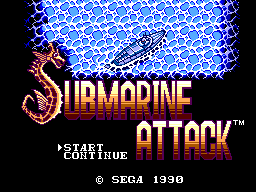 Submarine Attack is a side scrolling shooter much like R-Type or Sagia, except the main gimmick here is that it is set underwater. You battle through hordes of enemies, along the way collecting power-ups for your submarine to make it faster, you can also get weapon power-ups and auto-fire power-ups, you collect these by destroying small cargo vessels that appear on the surface of the ocean. Although the game is set underwater you are constantly under attack from battleships, jets and helicopters on the surface. Not only do you have to battle against enemy submarines, but also watch out for sea creatures and air pockets! At the end of every level you face a typical end of level guardian. I would say that the majority of these are pretty disappointing though. Nothing really interesting about them. 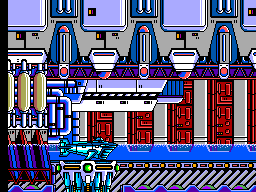 Something that surprises me about this game is that unlike the games mentioned earlier, R-Type and Sagia, there is no need to learn enemy patterns. You can pretty much "wing" every level. Ultimately, the game is far too easy. I have to say when I first switched this game on I was quite impressed by the graphics. The title screen has a nice picture, and when you start the game you see the submarine moving out of port and into battle. The actual game is also very nice, if you like colourful graphics this game will not disappoint. The sea setting is a perfect alternative to the usual space shooters. Under water we see a good deal of background detail, the enemies are nicely drawn. As I look at the detail level and perspective of the game I can't help but be reminded of Choplifter. Whether or not this is good or bad thing I'll leave for you to decide. 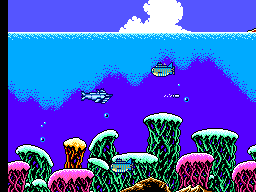 The music in Submarine Attack is what I believe to be some of the most impressive music on the Master System. The only problem is that there is not enough of it! All the levels have catchy little tunes that manage to keep you entertained are matched very well to the whole sea theme of this game. The sound effect are however, nothing to write home about. There is the usual array of dull thud sounds that are supposed to be explosions, and the torpedo and missile sounds are a little too loud for my taste, as you will be hearing these constatly. Without the aid of speed-ups the submarine is painfully slow and unresponsive. This is what the programmer intended though. It's just very lucky they made power-ups so readily available or this game would have been quite difficult. You really do feel quite powerless without at least a few power-ups. With a bit of powering-up the submarine soon becomes a mean machine. You will be almost invulnerable with the aid of a rapid fire unit - just make sure you don't pick up the auto-fire power-up while using this though! Although I really enjoyed playing through this neat little game I have to say I never really felt the need to re-visit it after completion. The game is just a little bit too easy for it's own good. If there were some alternate routes in there or the game was a bit longer it would be worth playing over, but sadly not. Enjoy it while it lasts, this game is a one-time thrill. Submarine Attack is well worth tracking down if you don't already own a copy. The game won't keep you amused for long, but the little time you have with it will be very enjoyable. I would recommend this game to anyone who likes side-scrolling shooters.